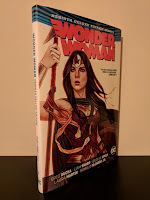 This volume picks up right where the previous volume left off, with Rucka continuing to alternate story arcs each issue in order to weave a tale between Diana's earliest days in man's world and the present. This may sound a bit confusing, and it did make things a little difficult to keep up with as the issues were originally put out, but when it is all collected together in the originally intended order (the trades collected each arc on its own, regardless of publishing/issue numbering), the alternating issue format works extremely well with each story arc informing the other as they progress. 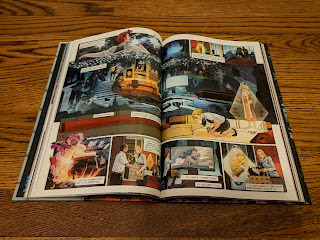 Liam Sharp continues to illustrate the modern day portion of the story with 'The Truth', the direct continuation of 'The Lies' from Deluxe Edition Book 1 which sees Diana struggle to wrap her mind around the fact that the past that she remembers was all a lie. Sharp's highly detailed, fantasy style is a perfect fit for a title like Wonder Woman. Bilquis Evely takes over for Nicola Scott on the story arc based in the past. This one is titled 'Godwatch' and picks up where 'Year One' left off. Like Scott, Evely's style provides a nice contrast to Sharp's so there's no confusing which part of the story you are reading (past/present). Nicola Scott did return to the book to pencil the annual issue, showing Wonder Woman's first interaction with Batman and Superman in Rebirth continuity. 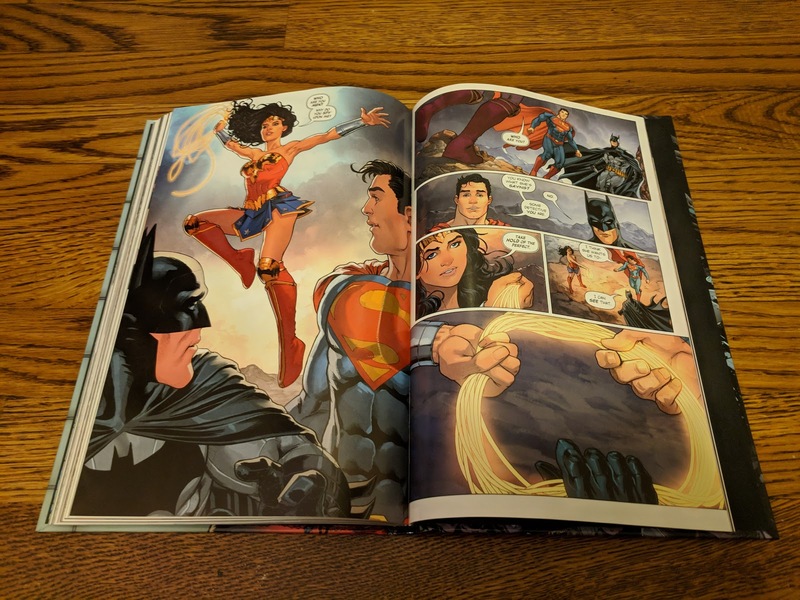 That annual is collected at the end of this volume along with a short, Evely-drawn Wonder Woman/Batman team up story from the DC Holiday Special 2017. 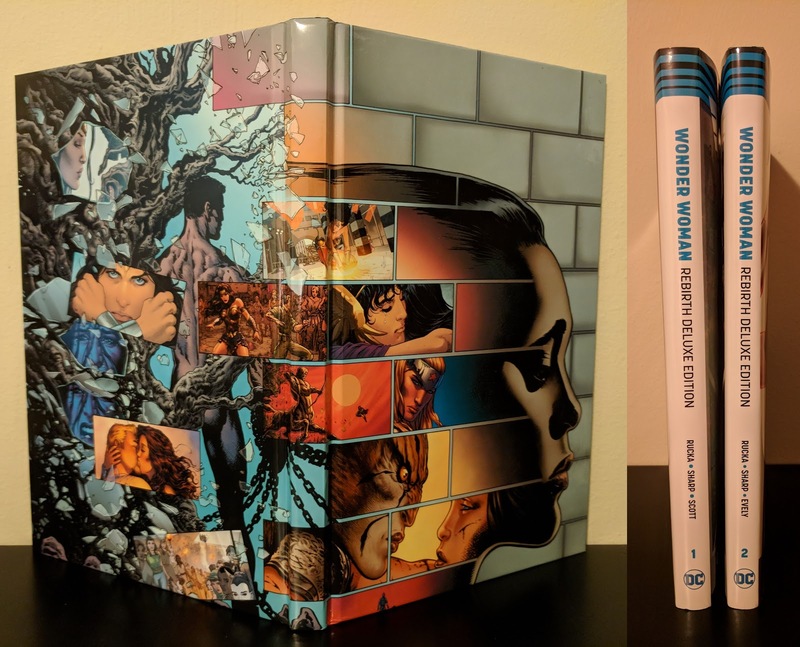 A recurring staple in the Rebirth Deluxe Editions, this volume reprints the variant covers for the issues collected. In this case, that means we get a nice dose of beautiful Jenny Frison artwork. 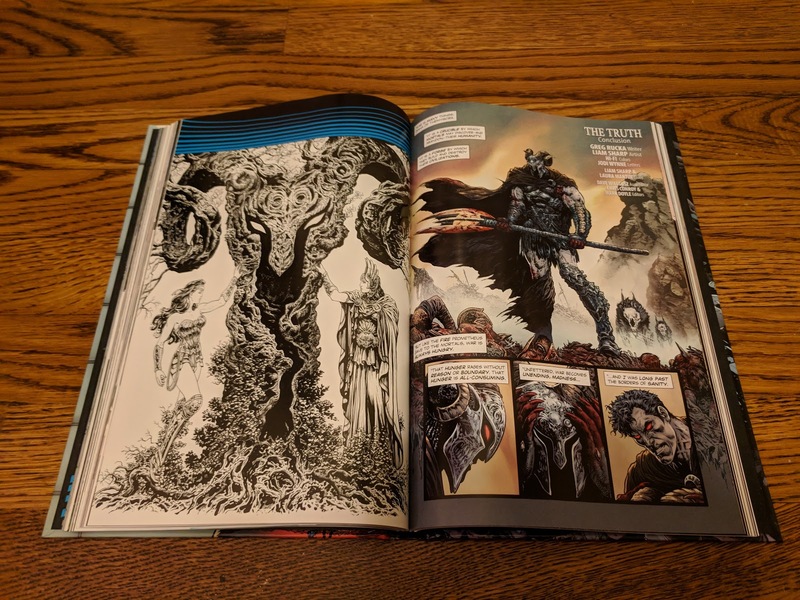 There are also a few pages with an assortment of character designs, pencils, layouts, and in-process rendering steps from Bilquis Evely. Under the dust jacket there is a gorgeous wrap-around cover with an image from the early pages of issue fifteen which combines the work of Liam Sharp and Nicola Scott. 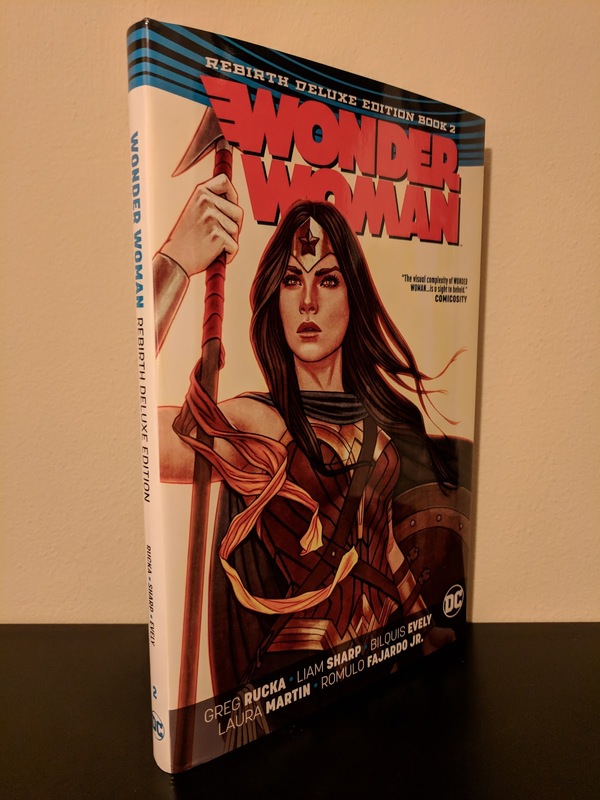 When DC began its Rebirth initiative, Rucka signed on for the first year, which with the bi-weekly shipping schedule covered the first twenty five issues of Wonder Woman. His leaving the title after just a year is unfortunate in that the quality on the title hasn't been nearly as high since his departure. On the other hand, he was able to successfully complete his story on his terms this time around. His original Wonder Woman run was interrupted by editorial mandates and he was not able to tie things up the way he intended. I feel like the first half of this run (Deluxe Edition Book 1) is just a tad stronger, but this volume provides a solid finish to the story that Rucka, Sharp, Scott (then Evely) set out to tell. Certain creators 'just get' certain characters, and it is obvious that Greg Rucka 'gets' Diana of Themyscira. Having just re-read this run, I'm looking forward to refreshing my memory on Rucka's earlier work on the title to see which I feel is stronger as a whole (now if DC would just release the third trade paperback volume). 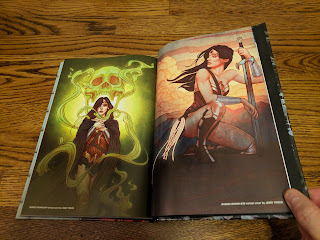 Both are excellent and in my mind rank highly when compared with other Wonder Woman stories that I have read. This run may not be quite as new-reader friendly as some other titles from DC's Rebirth-era. 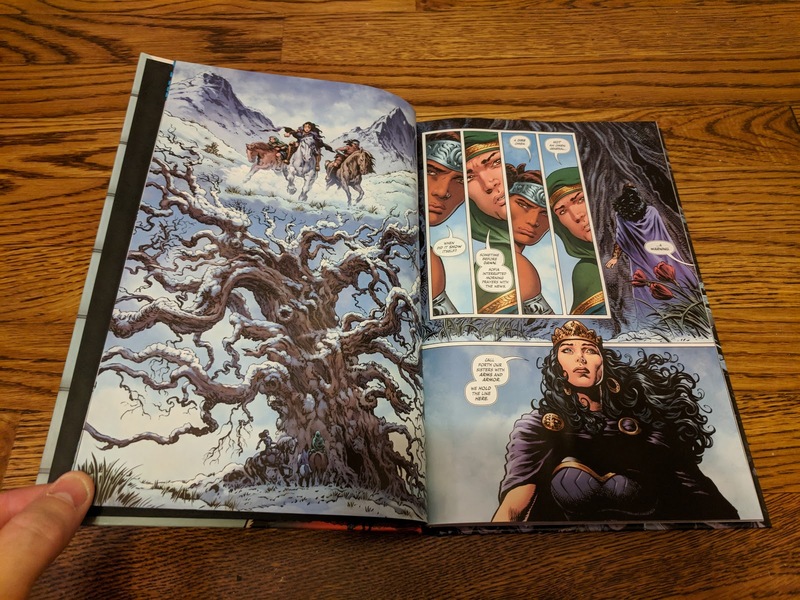 You'll definitely get much more out of the story if you have some familiarity with previous Wonder Woman continuity. That being said, if you're a fan of the character and/or Greg Rucka's writing, this is absolutely a run to check out.